Training doesn’t have to be expensive. It doesn’t have to be led by a teacher. It doesn’t even have to be called training. Key to the success of Dev8D is how it provides training in an atmosphere of friendly, playful collaboration. Developers are given the opportunity to hone their skills and learn new tips and tricks in areas they already understand, as well as developing new skills in subjects which are completely new to them. And as individuals benefit from this training, so do universities. Developers return to their institutions full of ideas for new projects – and armed with the skills and contacts to make those ideas reality. Dev8D 2010 was divided into different zones, with varying degrees of formal training. At the top of the scale were the coding labs, in which attendees were submerged for several hours in intense training in a specific area such as Clojure or Python. Next were the workshops – group sessions to discuss specific areas such as Linked Data or cloud computing. The expert sessions hovered in the middle of the formal to informal training scale – as a collection of 15 minute lightning talks, they varied from tips on how to avoid common security faults in university websites to a conversation about how developers could become more involved in climate change issues. Informal training took place in the Project Zone and Basecamp, places for people to show off projects they had built, work on new projects, and chat with other developers. Everywhere you looked at Dev8D, people were learning new skills or developing existing skills. The most narrowly defined training of the week took place in the coding labs, under the guise of ‘programming dojos’. The programming dojos took the essence of paired programming and dressed it up in martial arts, as ‘Ruby on Rails Sensei’ Tim Donohue explains. Dev8D is a valuable training resource – a cost-effective way for Higher Education institutions to keep their developers up to date with the industry. While the formalised training is undoubtedly useful, it can sometimes be the more informal training which yields the greatest results. Dev8D facilitates this kind of informal training by cunningly provides lots of opportunities for developers to talk to one another. Whether it’s by building an arduinos together in the workshop or sharing a power socket in the basecamp, there are ample opportunities to meet friendly people who want to talk about their work and are happy to share their skills. Ongoing training is important in any industry, but in the higher education sectory it is essential. Insttitutions which don’t encourage their developers to keep training risk missing opportunities – opportunties which may lead to new research avenues, opportunities which lead to commercial applications, opportunities which will help institutions to operate better as a whole. As budgets are tightened across higher education institutions must get smarter in how they approach training – and events like Dev8D could become increasingly useful in maintaining the skills of the sector. This entry was posted in Innovative institutions, Training and skills on March 8, 2010 by MShaw. Kieran Marron is a web developer at Eduserv, a not-for-profit organisation which delivers technology for various public sector services. What are you hoping to get out of Dev8D? This if the first time I’ve ever been to this kind of thing. I’m here out of sheer intrigue! Yesterday morning I attended all of the lightning talks, and I’ve also been to the Zenity coding dojo. The dojo was a very good session, it was a great way to learn from other people. What kind of skills are you gaining by being here? I’m very keen to learn more about Zenity, as it’s about repository data stores and sharing data. It’s definitely something we’re going to be using so it’s good to see how it’s been applied early on. More generally it’s also good to see a whole hall of people working on madcap ideas, just trying things out together and seeing what can happen. Of all the projects or ideas you’ve seen, which will have the greatest impact? The 3D printer has definitely stolen the show, It’s absolutely mind boggling! The fact that anyone can do it, and it’s so cheap. This entry was posted in Dev8D 2010, Interviews, Training and skills on February 26, 2010 by MShaw. Charles Severance (aka “Dr Chuck”) believes anyone can be a web developer. Here he explains how. 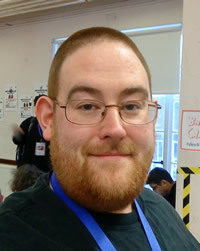 “My crazy dream is for everyone in the world to build their own web applications. Non-technical people are creating content online with text, images and video, but I think there’s scope for so much more. I want to help people create their own Twitters, their own Facebooks – any database-backed website they can think of. Google have created a way in for this democratisation of web development with their Google Application Engine, which is a free hosted service for apps. $10 a month for php hosting might not be a big deal for someone in the UK or USA, but for much of the world it’s a lot of money. But now we’re opening up web development to people who might only have access to a computer once a week, from an internet cafe. So Google have provided the infrastructure for low-cost web applications, but we also need to give non-developers the skills to create whatever they want. My intention with the book was to take someone who knew nothing about programming, and in a couple of weeks teach them the HTML, CSS and Python they need to create an app which can run in the Google cloud. I want to bring down the limitations of what you can do online. I want people to leave the limitations of MySpace and instead start thinking of ‘my space’ – their space. Everyone on this planet has the right to own their presence on the internet. 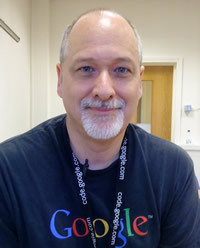 Charles Severance’s book Using Google App Engine is published by O’Reilly. Steve Lee from OSS Watch and Will Walker from GNOME gave a lightning talk on accessibility. 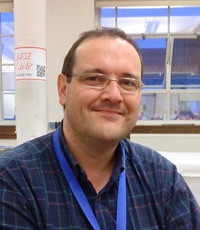 Here Steve talks about why accessibility is an important issue for web developers. “There are a several views with accessibility – the most prevalent is that it’s about helping people with disabilities to interact with technology. But it’s also about widening technology use generally. The emergence of mobile platforms, for example, has increased the ways in which people use devices. A classic example is a SatNav in a car – it needs audio instructions because it wouldn’t be practical to use a mouse in that situation. There are certain accessibility issues that we see all the time – one of the worst offenders is requiring users to use a mouse. Blind people don’t use mice, and many people with physical impairments use switches which use keyboard commands. So there’s no way those people would be able to use some whizzy feature you can only see if you wave the mouse cursor. This entry was posted in Dev8D 2010, Interviews, Training and skills on February 25, 2010 by MShaw. 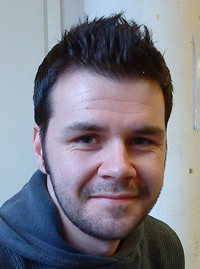 Ben Charlton is the systems administrator at the University of Kent. He gave a lightning talk on web security, going through the OWASP 10 worst web security mistakes – and how to fix them. Why did you give a web security talk? It’s a hobby interest for me and my day job as well, and it seemed an area that was missing on the programme. Web security is something we’ve had a problem with at Kent, and I imagine lot of other universities will be having similar issues. Universities tend to have a lot of people doing a lot of things online, and there’s not always a great deal of attention paid to security. I’ve already had someone come up and ask for more details – it’s impossible to cover everything on web security in 15 minutes. Hopefully the people who were in the room can now go and find out more about the issues, and it will lead to more secure websites. What do you think your institution gains by sending you here? Kent gain from a greater breadth of knowledge. I’ve found out about LTI – a really useful way of embedding learning objects in a VLE. That’s something we had no idea about until today. So it’s great for picking up on new technology. Are you involved in any other communities? List8d is another project I’ve been involved. I’m also interested in library systems. What kind of skills are you gaining or improving by being here? From attending Dev8D last year I knew there would be loads of different areas to get involved in. It’s amazing the things you pick up that you never expected to, just from chatting to people. Of all the projects or ideas you’ve seen, are there any you think can be put into action straight away? Wookie is interesting, and of course LTI has immediate applications for the University of Kent. There’s also lots of stuff that isn’t directly relevant but makes you a better programmer, like the stuff on genetic algorithms or learning about Clojure. This entry was posted in Community networking, Dev8D 2010, Innovative institutions, Interviews, Training and skills on February 25, 2010 by MShaw.